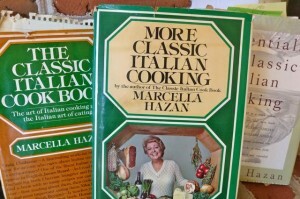 I never met Marcella Hazan but we spent many an hour together in my kitchen. Hazan, 89, died Sunday at her home in Longboat Key, Fla. Her beloved husband, Victor Hazan, was with her. Authenticity and simplicity were the foundations of Marcella Hazan’s cookbooks. The title of her 2008 memoir Amarcord (“I remember” in the dialect of her native Romagna) sums up her career: Marcella Remembers: The Remarkable Life Story of the Woman Who Started Out Teaching Science in a Small Town in Italy, but Ended up Teaching America How to Cook Italian. And teach she did with her first volume The Classic Italian Cookbook and six subsequent titles. She received Lifetime Achievement Awards from the James Beard Foundation in 2000 and the International Association of Culinary Professionals in 2004, as well as an Italian knighthood. Victor was her inspiration, lifelong collaborator, and writing partner (she wrote in Italian and he translated), himself an authority on Italian food and wine. Love was at the heart of all she did. When she met Victor, an American who had been born in Italy and lived there as a child, he had returned to Italy to write and to eat. She was a scientist with no interest in food or cooking. We all thank Victor for his ardor and persistence. Marcella and Victor’s son, Giuliano Hazan, is stirring the pot for the next generation. Do you have memories of Marcella, her cookbooks, or classes? What a charming story! Imagine–falling in love with a man who introduces you to the love of food! The title of her book is just fantastic. It gets right to the point.